Individuals who require a tracheotomy or a tracheostomy usually experience one of three thrings: 1- to bypass an obstructed upper airway, 2- to clean and remove secretions from the air way and 3- to easily and safely deliver oxygen to the lungs. This medical procedure can be temporary or permanent and is commonly referred to as a stoma (the name for the hole in the neck which the tube passes through). An opening in the neck is required in order to place a tube into the individual's trachea (windpipe). If your tracheostomy is temporary, there is typically only a slight scar on the neck when the tube is removed. If it is permanent procedure you may need assistance while you get used to the stoma, particularly when it comes to cleaning and maintaining the tube. 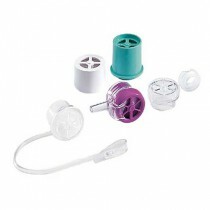 Speaking Valves - Allows airflow to pass through the oral and nasal chambers. It also aids in the opportunity to speak uninterrupted without having to wait for the ventilator to cycle. 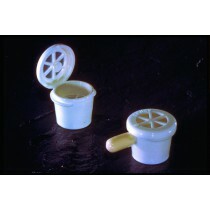 Improves communication, swallowing, oxygenation and facilitates secretion management. 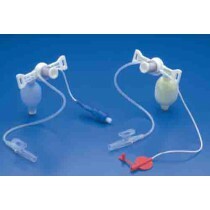 Tracheostomy Tubes - Soft silicone is utilized for the Bivona Uncuffed adult Tracheostomy Tubes, which is an alternative to hard PVC plastic. This particular type of tube is recommended for individuals with sensitive tracheal mucosa or stoma and do not require ventilation.